delights beside the sea. This tour highlights the top attractions of Englands Magical eastern corner. EXCURSION 1: We enjoy a morning visit to delightful Cromer entrance to the Crowmer Museum is included and youll have free time explore this delightful Victorian Seaside town. We leave early afternoon and head along the stunning North Norfolk Coast to Morston. Hear we board our Wildlife Cruise taking us out to Blakeney point to look out for the resident seals in their natural habitat  a must do experience. EXCURSION 2: Today we head for stunning Holkham Hall  one of the Treasure Houses of England and home to Earl of Leicester and his family. The House has been inhabited by the Earls of Leicester since the 1750s. The family take great pride and joy in sharing the house and its treasures, the deer park and Holkham beach, with their visitors and we are sure youll thoroughly enjoy your visit which includes time to see the Hall, Walled Gardens and Bygones Museum. This afternoon well enjoy a stop at Wells-next-the-Sea, a beautiful and historic seaside resort. 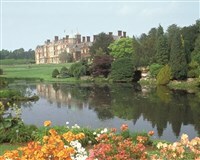 EXCURSION 3: We visit nearby Sandringham today. We spend the full day exploring the house which dates back to 1870, the beautiful gardens, country park and the museum which houses an extraordinary collection ranging from the very large  the 1939 Merryweather fire engine  to the very small  tiny Indian doll dancers in the Curio Cupboard  and from the grand  gifts in pearl and exotic hardwoods given to The Queen on State Visits abroad  to the personal  the clock used in the Royal Pigeon Lofts at Sandringham to time her Majesty's racing pigeons.